Within four days of the passage into law of the legislation governing Tanzania’s new Multi-party system on July 1 1992, some 36 sets of application forms to be registered as political parties had been applied for. CHAMA CHA DEMOKRASIA NA MAENDELEO (CHADEMA) former Finance Minister Edwin Mtei and former Junior Minister Edward Barongo. NATIONAL CONVENTION FOR CONSTRUCTION AND REFORM (NCCR-Mageuzi) Dar es Salaam lawyer Mabere Marando and Prince Bagenda. In introducing before Parliament the Bill for the Eighth Constitutional Amendment in Dodoma on April 30 1992, Prime Minister and First Vice-President John Malecela, stated that the Government would be presenting a series of Bills in the future to implement several of the recommendations of the Nyalali Presidential Commission (Bulletin No 42) but it did not accept all of them. The Commission had proposed, for example, a new form of federation with separate governments for the Federation, the mainland and Zanzibar. The Government did not accept this proposal because, although there were problems between the present Union Government and Zanzibar (in the areas of citizenship, exchange control, division of customs revenue, and the financing of the Union) the solution did not lie in setting up a Federation which would weaken the solidarity of the nation. The present constitutional set up would continue for the time being. Addressing thousands of people who turned up at the Mnazi Mmoja grounds on August 7th the Chairman of CHADEMA, Mr Edwin Mtei promised to promote local industry and cut down the importation of raw materials which should be obtained from within the country. The Interim Chairman on UMB, Chief Fundikira, speaking at his party’s first rally, called for multi-party elections within the next twelve months. The Government has announced that the elections will be in 1995. PDA Interim Chairman Nicholas Munuo blamed Socialism and Self Reliance for Tanzania’s present woes at his first rally. Meanwhile, the Chairman of the Dodoma branch of the unregistered Democratic Party, Rev Christopher Mtikila and nine others, have been arrested for holding an illegal meeting. “Who is handling the Bureau de Change” asked Member of Parliament for Makete during an interview in the Dar es Salaam Express. “The black people of Tanzania are not handling them because they don’t have the money to establish such activities.” But, as an Asian businessman, quoted in the same paper said “I may be of Asian origin, but as far as I’m concerned I am a Tanzanian.” So has begun what is being called the debate on Indigenisation or ‘Economic Mageuzi’. Some political parties are beginning to raise the issue. The Business Times, in an article under this heading, quoted Professor Jamanne Wagao, the Economic Advisor to Mwalimu Nyerere, as stating that the fall of the Ujamaa ideology was the man cause of the recent growth of religious militancy in Tanzania. People were searching for alternative ideologies. Sheikh Kassim bin Jima bin Khamis was quoted as called upon the government to create special seats in the legislature for representatives of religious communities as the checks and balances under a one-party state might not be there within a multi-party system. Christian militants were said to be accusing President Mwinyi of failing to take stern measures against fellow Muslims who were preaching against and insulting the Bible. In each of the last four decades, a new Law has been passed to govern Co-operatives in Tanzania. In 1968, in response to problems caused primarily by too rapid growth, the 1932 legislation was replaced by an Act which greatly strengthened the power of the government to intervene in Cooperative affairs. In 1975, the mould-breaking Villages and Ujamaa Villages Act made each village into a single corporation responsible both for the administrative functions of local government and the commercial functions hitherto carried out by Co-operatives. Everybody in the village was automatically a member. The Rural Primary Co-operatives ceased to exist and, shortly afterwards, the District and Regional Co-operative Unions were also abolished. 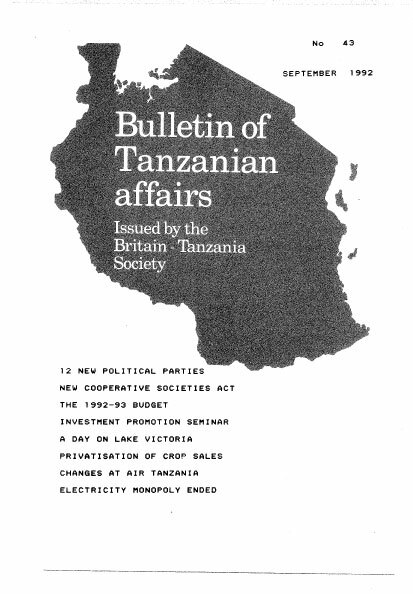 The 1982 Act, which was discussed in the January 1986 Bullet of Tanzanian Affairs, brought Tanzania more than half-way back to Co-operative orthodoxy. Now the 1991 Co-operative Societies Act has completed the process. Whether the 1991 Act represents final recantation of valuable Socialist principles or the welcome return of the Prodigal Son to the Cooperative father it is an outstandingly well-written piece of legislation. In its’ way, it is as radical as the 1975 Act. Many third world countries talk about the need for legislation which gives proper autonomy to Co-operatives. Tanzania. has led the way by producing such a Law. Many of the good features of the 1982 Act are retained in the 1991 Act. However, it is the changes which are of great interest. At the root of it all is one word in the 1991 definition, “A Cooperative Society is an association of persons who have VOLUNTARILY joined together…”. The omission of the underlined word in the 1982 definition was meant to preserve the 1975 idea that everyone in the Village was automatically a member. The 1991 Act not only restates the time-honoured Co-operative Principle of voluntary membership. Its’ details are also consistent with all the Six Principles supported by the International Co-operative Alliance. The 1982 statement that Co-operatives act in accordance with a ‘Socialist outlook” is gone. So is the rule that all Co-operative activity in a village should be under the umbrella of one multi-purpose Co-operative and of a Co-operative Development Committee. There is practical support for small group enterprise since groups with specialized skills are allowed to register with as few as four members. Whereas the 1982 Act required the Registrar to “exercise control” over Co-operative Societies, the new requirement is to “promote, inspect and advise”, and there is a new emphasis on the duty of providing educational support. Although the Audit Commission is preserved, Societies now have the option of choosing “any competent and registered auditor appointed by the general meeting and approved by the Registrar”. The word “Apex Co-operative” has e different meaning from before, No longer does the Act DICTATE a three-tier federal structure with one Appex. Now a four-tier structure is suggested subject to the consent of members. The proposal is for a single national federation with sectoral apexes in membership. All reflections of the National Apex as a party organ parallel with youth wing and the women’s organisation (UWT) are gone. The 1982 Act ALLOWED the Registrar gradually to delegate certain duties to the APEX ORGANISATION as soon as the Apex was judged to be competent. The 1991 Act DIRECTS the Registrar to delegate to “THE COOPERATIVES ON MUTUAL AGREEMENT”, The direction would have more force if it was accompanied by a time limit but the dropping of the judgement of competence seems important. It may represent the abandonment of a recipe for perpetual paternalism. Few paternalists abandon power if they have been directed to wait till their proteges are competent. Finally, let us hope that the full potential of this liberating legislation will be realised. The “Registered Villages and Ujamaa Villages” failed so far as they did not bring prosperity to the people. Meanwhile in the African countries, Co-operatives closer to the orthodox Western pattern were failing equally badly. The poorest third of the population need other structures if they are ever to pull themselves out of poverty. The problems have not gone away and the search for solutions as radical as those associated with Ujamaa should still be on. A pessimistic interpreter can see the new Act as a jump backwards from Socialistic modes of Co-operation which did not help the poorest to older styles which did not help them either. Alternatively, it can be seen as a commitment to trust the people to choose their own modes of Co-operation, anywhere on the spectrum between Marx and Adam Smith. Let us hope the second will prove closer to the truth. The Government has retired seven top executives (including the General Manager and the Director of Finance) and has demoted the Di rector of Operations and the Technical Director of Air Tanzania Corporation. This action followed within a few days of the appointment at the beginning of June of a new Chairman of the Board of Directors – Principal Secretary in the Ministry of Communications and Transport, Mr Richard Mariki. The Government has also taken over Shs 12.4 billion accumulated debt. It is believed that a substantial percentage of the work force will be laid off and private investors will be invited to buy shares in the company. The Corporation has announced increases in domestic tariffs of between 50 and 100% effective August 10, 1992 – Dally News. The budget speech of the Minister for Finance was delivered in the National Assembly on June 18 1992 by Professor K A Malima who had recently exchanged jobs with Mr Steven Kibona as Minister of Planning. Thus, as Professor Malima generously acknowledged in his speech, a large part of the preparatory work had been supervised by his predecessor. The underlying purpose was stated to be to continue the reforms towards greater market orientation and institutional financial responsibility set in motion in successive economic recovery programmes. Inevitably, therefore. a considerable part of the speech was devoted to a survey of reforms already begun or accomplished. The object of these changes was to open up the economy to private enterprise, to reorganise parastatal organisations on self-sustaining commercial lines, to expose the banking system to competition, to remove from the banks the severe handicap of non-performing assets and to institute various measures aimed at trade liberalisation and a wider access to foreign exchange. The full effect of these changes was likely to become visible only in the medium term. but already some encouraging results were emerging. In comparison with the previous year. the dollar value of exports was expected to show an increase of 7.4% Agricultural production was showing encouraging signs of expansion. At the centre of the reforms needed was a progressive reduction of the Government’s dependence on external financing to balance not only the domestic budget , but also the country’s foreign trading and payment s account. Revenue in 1991-92 only financed two thirds of recurrent expenditure. the balance being made up out of foreign loans and grants, while export earnings only paid for about a third of minimal import requirements. The bulk of these deficiencies will eventually be made good as a result of economic growth, but a significant contribution was expected as a result of the institutional reforms now in train, or in prospect, and a generally enhanced regard for efficiency and productivity. The continuing expansion of Government activities in recent years, beyond the limits of available revenue has led to a deterioration in the quality of Government services. an increase in the number of incomplete projects and neglect of preventive maintenance. It was therefore intended that the role of Government should be redefined with the aim of reducing its scope to a size capable of being financed out of revenue based on a small and highly efficient civ11 service. Government would withdraw from activities that could effectively be carried out by the private sector. Central to the remaining functions of Government will be law and order and the provision of economic and social services. In the case of the social services an element of consumer contribution is envisaged. An element in the reform of Government business is the search for simpler procedures. In future the customs tariff will only contain four rates instead of five and excise duty only two in place of eight. But a notable change announced in the speech is a substantial reduction of customs duty, sales tax, income tax and company tax. The objectives here are to reduce costs of production, to alleviate the burden on consumers and bring about a reduction in tax avoidance . The effect on consumers is of special significance in view of the adverse effect of inflation on personal incomes. The abolition of customs duty and sales tax on all industrial raw materials will not only reduce costs, but also help industries to compete effectively in home and overseas markets. Other taxes have been abolished either because they are obsolete or because they are at odds with present policies. Examples are the 20% levy on the value of air tickets for foreign travel and a 1% tax on share capital. A number of reasons were given in the budget speech for the decision to reduce taxes. It has been observed that, in view of the narrow tax base and the constant increase in Government services, it had become necessary to raise taxes by substantial amounts in order to balance the books. The result had been a marked reduction of the take-home income of the workers and a decline in revenue collection through tax avoidance. The tax burden was also adversely affecting industrial productivity. The widespread reduction of customs duties and sales taxes and their abolition on certain items has prompted the Government to discontinue all exemptions hitherto enjoyed by Central Government, Local Government, political parties, religious institutions (except for items used in worship), Non-Governmental Organisations and charities. Local NGO’s and charities will not, however, have to pay tax on materials and commodities given them as donations to be passed on as free gifts to the needy and the poor. The budget included the customary civil service salary increases to compensate for inflation. It was admitted that salaries were inadequate in view of the high cost of living and that efficiency had been impaired by a lack of appropriate working tools and poor remuneration. While little specific provision appears to have been made in this budget to ameliorate these underlying problems, it may be assumed that planned reduction in the scope of Government services will provide the necessary opportunity. The budget is a courageous sequel to previous budgets and, in its fiscal provisions , a daring attempt to grapple with deep underlying problems. As a forecast of budgetary performance much reliance is placed on expected psychological reactions, which may or may not eventuate in whole or in part, but the attempt was certainly worth making. Will the new tax structure enhance production , increase efficiency, reduce absenteeism and raise expectations as a result of improvement in morale? Will the more moderate level of taxes reduce tax avoidance? Will simplification of Government procedures result in greater efficiency? All of these outcomes are justifiable hopes and it will be profoundly interesting to read in next year’s budget speech how far hope has been transformed into fact. Writing in a ‘Tanzanian Special Report’ in THE GUARDIAN (May 21 1992) Brian Cooksey pointed out that Tanzania is one of the last four counties in the world to retain socialism as its official creed. Although the National Assembly had recently passed legislation for multi-party government, proposals to remove all reference to socialism from the constitution had been roundly defeated. A decade of pressure from the World Bank and Western donor nations had so far failed to persuade Tanzania to ditch former President Nyerere’s collectivist ideology. For years his distinctive brand of African socialism had inspired millions of the continent’s poor and oppressed. One of the ironies had been that, until the early 1980’s, Western donor policy advice – the World Bank included – had been almost entirely supportive of the statist policies of the Nyerere years. With capitulation to the Bank and the IMF, Tanzania’s radical international reputation had declined and interest in Tanzania’s development model had waned. AN OVERSEAS BRANCH OF THE CCM? AFRICA EVENTS (July 1992) quoted CCM Party Secretary General Horace Kolimba during a speech given on June 11th at the Tanzanian High Commission in London as saying: “The work place must remain a place of work , Including this mission”. In the past, he said, the High Commission had been considered as an overseas branch of the (CCM) Party. “Not any more, from July 1st” he went on. “No party will be allowed to have any branches in any place of work” . Zanzibar President Dr Salmin Amour was reported in the August issue of AFRICAN BUSINESS to have announced that the islands are to establish two free ports – one on the West coast of the main island and the other at Micheweni in Pemba, two sites where virtually no economic activity is going on at present . ‘This novel (whose Swahili title is ‘Bwana Myombekere na Bibi Bugonoka na Ntulanalwo na Bulihwali’) is in the best sense unique, Never before was a novel of its kind been written in Africa and never again can such a book be written.’ With these words the WESTDEUTSCHER RUNDFUNK (West German Radio) revealed that a novel about early life in Ukerewe written by the late Aniceti Kitereza and already published in Swahili and English (the latter by the Tanzania Publishing House) has now been published in part (the first of two volumes) in German. (The remarkable story of how the book came to be written and the large number of persons and agencies involved was given in Bulletin No 14 in 1982 – Editor). Pointing to recent visits to Tanzania by Indonesian President Soeharto and Malaysian Prime Minister Mahathir Mohamed, AFRICA ANALYSIS in its June 12 issue reported on Tanzania’s ‘dynamic policy to reactivate Afro-Asian solidarity … The new South South focus is expected to result in joint ventures . . .. already Malaysia is helping with a palm tree project in Kigoma and discuss ions are under way with Indonesia on gas exploration’. President Mwinyi was said to be taking a keen interest also in regional conflict resolution. Because of its relative political stability and geography” Mwinyi had been able to successfully mediate between Burundi and Ruanda and between Kenya and Uganda and had played a pivotal role in efforts to revive East African economic cooperation. “I travelled around Pemba in the local covered, but open sided ‘buses’• wrote Frank Nowikowski in a full page art1cle on Zanzibar in the BUENOS AIRES HERALD (March 1 1992). “I asked for directions to a nice sandy beech … but such a concept did not seem to be understood …. In the main town Chake Chake there is one small hotel with five rooms . In the other two settlements on the island there are identical hotels, even down to identical wall clocks in identical positions, behind identical reception desks ….. Pemba is not geared to tourism” . As part of a supplement on Human Development in the June 1992 issue of AFRICA EVENTS Prof Sulaymen Nyang, Director of the African Studies Centre of Howard University, Washington DC, gave his views on what he described as the’total failure’ of Julius Nyerere’s Ujamaa policy. ‘I am inclined to make a tentative conclusion’ he wrote ‘that a significant part of the failure was the coerced villagisation .. Unwilling to pay adequate attention to the belief systems of the diverse ethnic groups of Tanzania … President Nyerere’s ilks wittingly or unwittingly committed a serious blunder … the separation from their (the peasant’s) ancestral lands could not be compensated by creature comforts identified with this illusive stage called development … perhaps the fate of Ujamaa could have been very different .. . if a programme of effective social psychological mobilisation (had been) mounted by the government ‘. Reporting on a recent visit to Japan by members of the Tanzania Coffee Marketing Board the JAPAN TIMES recently explained that Japan is ranked second to Germany as far as the trade value of coffee imports from Tanzania is concerned. Demand for Kilimanjaro coffee was stable in spite of increasing imports from other countries such as Kenya. ‘It is ludicrous for anyone inside the Tanzanian ruling elite to suggest that (former Tanzanian cabinet minister) Oscar Kambona should be any other than a Tanzanian by birth’ wrote a reader in the June issue of NEW AFRICAN replying to an ellrl1er article 1n which a Tanzanian had been quoted as saying that he was originally from Malawi. ‘Mr Kambona, who was once the number two in the Tanzanian leadership hierarchy and a crown prince to Dr Nyerere, had dedicated his early political life to the fight for Tanzania’s independence. How can anyone doubt such a man’s patriotism? .. The Government should rehabilitate Mr Kambona and incorporate his party into the new political life of the country’ the reader concluded. The LONDON EVENING STANDARD (August 14) published a letter from Mr Kambona in which he stated that he wished to join those paying tribute to the former Prime Minister of New Zealand, Sir Robert Muldoon, who has just died. Kambona wrote that it was Sir Robert, in a humanitarian act, who had used his influence to bring about the release from detention in Tanzania in 1978 of his two brothers, Otini and Mattiya. An article in MOSCOW NEWS quoted in the July issue of ‘ New African’ described how the Russian Federation, groaning under a huge external debt, is demanding payment of some 14 billion convertible roubles (£804 million) owed to the former Soviet Union by various African countries. A table listing 32 African debtor countries had Tanzania in the sixth position (after Angola, Algeria. Zambia, Libya. and Mozambique) with debts of 295 million roubles for military assistance and 34 million roubles for economic assistance. THE LAST GREAT UNTESTED NICKEL BELT IN THE WORLD? In what was described in the July issue of AFRICAN BUSINESS as a milestone in Tanzania’s drive to secure foreign investment the magazine revealed that the government had signed an agreement with Kagera Mining Company, a subsidiary of Sutton Resources of Canada which would provide mining exploration and development options to the company for an area of 25,400 sq kms in the Kagera Region . The agreement represents a follow-up to exploration in a corner of the region, Kabanga, where the nickel deposit is estimated to contain 40 million tonnes, grading 1.05% nickel, and also cobalt and copper. This is what its inventor, Shiyana Saleh Mandevu, a 58-year old peasant, poet and former truck driver, calls his new Swahili script according to an article in NEW AFRICAN (July). His writing was said to be rather like Pitman’s Shorthand with Arabic influences. It was his collection of ancient objects bows, arrows, clay pots and other handicrafts – which inspired him to devise the new script. Two horizontal bows with their strings facing upwards mean ‘baba’ (father), two traditional stools read ‘mama’ and so on. Anthony Daniels (the author of the book ‘Filosofa’s Republic’ based on his experiences as a doctor in Tanzania and reviewed in Bulletin no 36) launched an unusually vitriolic attack on Mwalimu Nyerere in the DAILY TELEGRAPH on July 3, 1992. He wrote: ‘Present-day reality has an autosatirical quality about it. How else is one to account for UNESCO’s recent award to ex-President Nyerere of Tanzania of the Simon Bolivar Prize for services to freedom, independence and the dignity of peoples. (The award of US$25,000 was shared with Burmese Opposition leader Aung San Suu Kyi; the jury said in its citation that Nyerere had worked tirelessly in the struggle against poverty, disease and ignorance; it took note of ‘the ethical ideal of honesty that personifies Julius Nyerere’ – Editor). Daniel’s article went on: ‘Nyerere strutted and fretted his hour (or quarter of a century to be precise) upon his own small stage (Tanzania) and forced millions of people from where they were living, herding them into collectivised villages so that they could come under the control of his Chama Cha Mapinduzi .. . . not only did the Swahili Stalin get away with it but he received the bien pensant of Europe even as the huts of the recalcitrant peasants were burnt down …. Nyerere was not entirely original in his ideas … he received a Fabian training at Edinburgh University but his road to Damascus was actually the road from Peking airport to Peking. Mao arranged for a couple of million helots of welcome to wave flags at him … it turned his head and all that was needed to complete the catastrophe were a few economic advisers from the Institute of Development Studies at Sussex University …. AFRICA EVENTS Zambian reader Jimmy Mdluli in the July issue compared President’s Kaunda and Nyerere. President Kaunda had eliminated all opposition and the only people he had genuinely attempted to groom as his successors had been his own sons. By comparison, when Tanzania’s first President (Nyerere) stepped down, he had left a couple of obvious successors whom he had thoroughly schooled in politics and statesmanship. Writer Jim Berry used these words to describe the Selous Game Reserve in the DAILY TELEGRAPH ON July 25th. ‘ Much about the Selous is unexpected ‘ he wrote. ‘Despite being Africa’s largest wildlife sanctuary it is also one of the least known and least visited. Its 2000 sq miles make it almost the size of Ireland … within its perimeter there are three separate ecological entities whereas the – admittedly smaller – Serengeti National Park cannot accurately boast one …. this vast area was named after the celebrated Frederick Courtney Selous, a towering figure among early white hunters … he was killed by a German sniper near Beho Beho. One afternoon we walked the few miles to where he fell. Old cartridge cases and other rusted military paraphernalia still litter the overgrown trenches. Selous’ grave, marked by a marble plaque set in a simple concrete slab, stands nearby …. Lady Chalker of Wallasey, Britain’s Minister for Overseas Development, replied robustly in the SPECTATOR (May 9 ) to an earlier article attacking foreign aid which had been sceptical about the reality of the southern African drought. The article had spoken about Tanzania earning twice as much through foreign aid as it did through exports and of the lack of incentive for Tanzanians to grow exportable crops in a hot climate – only to be paid a fraction of their worth’ when you can go to Dar es Salaam, sit in an air conditioned office and lay your hands on untold dollars by bureaucratic intrigue’. Lady Chalker wrote to the editor that she really could not decide whether it was his arrogance or ignorance which appalled her the more. She pointed out that the article was out of date and listed the numerous changes that had occurred during recent years in aid policy. In 8 cover story on Political Assassinations in Africa AFRICA EVENTS (August 1992) went into some detail about the assassination (while he was playing dominos) of the late President Karume of Zanzibar on April 7, 1972 . ‘By no means’ said the article ‘was the assassin, Lt Humud Muhammed Humud , a lone player. He had accomplices at the scene who were subsequently either gunned down by the security forces or committed suicide. Humud died on the spot in circumstances that are still not clear … the Government (had) insisted that the assassination was part of a plot to overthrow it. But Humud had had a personal motive … his father had been arrested a few months after the Zanzibar Revolution of 1964 and, while Humud was training later in the Soviet Union he had been told that his father had been executed … he had vowed revenge ‘. But there had been political factors also. By 1972 the revolution hed degenerated into a tragic farce – gross abuses of human rights, political killings, a curious system of people’s courts, forced inter-marriages , a declaration by Karume that there would be no elections for fifty years …. Karume had become an embarrassment to Nyerere and a danger to the future of the Union .. . ‘ . The blood of Humud and his colleagues had not been shed in vain, the article concluded, as it had enabled Nyerere to subsequently consolidate the Union through the joining together of the TANU and CCM parties, the neutralisetion of those who considered themselves to be Karume’s legitimate heirs and the subsequent far-reaching constitutional changes and liberalisation which had followed under Zanzibar Presidents Jumbe and Mwinyi. On page 1 ‘Dodoma: A Capital Nobody Wants’ in which it wrote that the Government had backtracked on its decision to move Tanzania’s capital from Dar es sal aam to Dodoma because of a lack of political will and the ‘hopelessly collapsing national economy …. .. although no official announcement is expected from State House’. On page 3 under the heading ‘Malecela Must Show Political Maturity’ it accused Prime Minister and First Vice-President John Malecela of suffering from ‘leadership fatigue’ after what it described as the ‘big flop’ of Mr Malecela’s visit to Namibia. What irked the Family Mirror was what it described as the ‘old-fashioned … tired politics’ he had been preaching as exemplified by his warning to Africa that it was about to be ‘recolonised’. Quoting the example of foreign involvement in Kuwait, the Kurdish country and the Liberian Civil War it wondered why Mr Malecela didn’t realise that the old (OAU) concept of non-interference (in the affairs of other countries) had ‘ almost become irrelevant in the African political context. Mr Malecela still ’embraces mesozoic notions that western nations are exploiters and colonialists trying to impress their models on Africa’…. ‘Politicians without originality are finding it tough … as they try to concoct new situations and create new scapegoats to divert the attention of the world from their own internal problems. If Mr Malecela did not have any new agenda to sell to Namibians he could have discusssed common problems such as population explosion, foreign debt, drought, food shortages, civil wars, human rights etc . Page 4, ‘Dourado Speaks Out His Hind’, contained an interview conducted six years ago (shortly after he had been released from detention) but never published, with the ‘fiery, defiant but principled politician’, former Zanzibar Attorney General Wolfgang Dourado. “It was Mwalimu who detained me … not the Zanzibar Government” he said. “I was never given any grounds … but I believe that it was because I had been invited to present a paper to the Tanzania Law Society on the Consolidation of the Union. . . I was interviewed about it in the foreign media including the BBC . . . but in Africa one does not tread on the toes of venerable and infallible Founding Fathers’. Reacting to increasing criticism in the private press Prime Minister and First Vice-President John Malecela was quoted in the SUNDAY NEWS (July 5) as speaking in Zanzibar of a ‘covert campaign’ to discredit the CCM and the Government. He said that the country’s leadership welcomed criticism intended to rectify mistakes and lapses but strongly rejected reports aimed at arousing people’s resentment so as to isolate the Party and the Government from the population. He urged Tanzanians to be vigilant against ill motives and advised them to resist attempts to erode national unity, peace and solidarity. Until the middle eighties, importers and others requiring foreign exchange had to apply to the Bank of Tanzania and to make out a case for an allocation in competition with other applicants. In practice this procedure had two main disadvantages in conditions of extreme foreign exchange shortage delays were inevitable and widespread and foreign trade was severely hampered; and, centralised allocation was not always found to be an appropriate mechanism for adjudicating between rival claims. With minor exceptions, all foreign exchange holdings had to be surrendered to the Central Bank, or to the National Bank of Commerce, in exchange for local currency. In 1985 the central control of foreign exchange allocation was breached by removing the legal bar on the possession of foreign exchange in certain circumstances (‘own funds scheme’) and allowing exporters to retain a proportion of their foreign exchange earnings (‘retention scheme’) to meet the cost of importing machinery and raw materials and to import certain consumer items within a specified list deemed to raise public morale and offer an incentive for greater production (‘ incentive goods’) . The combined effect of these measures was to fill the shelves of the shops with goods, albeit generally at a higher retail price in shilling terms, and to raise spirits and expectations. While these measures bypassed the bureaucratic process for the procurement of some of the imports needed to sustain industrial production, they were not sufficiently wide-ranging to deal with all urgent requirements of foreign exchange. Furthermore, black market dealings , though they provided an informal means of access to foreign exchange, were nevertheless illegal and were depriving the established channels of scarce foreign exchange. Early in 1992 a new Foreign Exchange Act vested responsibility for management of the country’s foreign exchange in the Bank of Tanzania , including the power to make regulations. It became legal for any person to hold any amount of foreign exchange and to buy and sell it in the open market. In March 1992 the Foreign Exchange Regulations and the Foreign Exchange Bureau de Change Regulations were published in the Official Gazette. Bureaux de Change were set up in Dar es Salaam thus providing a legal basis for most of the transactions hitherto performed illegally. The device was not new, having been tried in a number of countries including Ghana and Uganda to good effect. It was hoped that this mechanism would go far towards undermining the black market and would draw into the public domain resources hitherto sidetracked into black market obscurity. The rate of exchange is determined solely on a market basis at weekly auctions. As foreign exchange remains a scarce commodity, it is expensive and figures in excess of Shs 700 to the £1 have been quoted. Such figures reflect not only the scarcity of foreign currencies, but also provide holders of foreign currency with a strong motive for selling it to the Bureaux. At the same time, the official rate of exchange fixed from time to time by the Bank of Tanzania continues to govern applications for normal trade purposes through the banking system. This rate is in the region of Shs 500 to £1, revealing a substantial gap between the two rates. The official rate, which, under present policy, is moving slowly upwards in accordance with the rate of inflation, will tend towards stability as inflation is reduced to a figure comparable with that of Tanzania’s main trading partners. The Bureau rate, however, will continue to be the value at which supply is in equilibrium with demand in the Bureau market and in the immediate future is likely to remain well above the official rate. It would be a mistake to designate either rate as the ‘right’ one as they are the result of different mechanisms and serve differing purposes. The Bureau rate reflects the extreme scarcity of foreign exchange and depends solely on the interplay of supply and demand. Under the present policy, on the other hand, the official rate is much nearer to the value at which the purchasing power of the shilling is in approximate equilibrium with the purchasing power of the dollar. It is the official rate that governs most commercial transactions, while the Bureau rote provides a useful safety valve in cases that cannot command commercial priority, such as international travel costs and overseas purchases for non-commercial purposes, It is, however, the Bureau rate that has less claim to underlying validity , as it is inflated by the present scarcity of foreign exchange. With the expansion of Tanzanian exports and the progressive narrowing of the unfavourable balance of overseas payments, the difference between the official and the Bureau rates will diminish. Ultimately, when Tanzania’s foreign payments account reaches equilibrium, the exchange rate gap will disappear and present arrangements for the publication of an official rate will be discontinued. As scarcity of foreign exchange will no longer influence dealings, the market rate, as determined by auction, will fall to meet the official rate and thenceforth all dealings, apart from minor adjustments to different transaction costs for different sizes of transaction , will be based on the interaction of supply and demand . A two-page spread in The Guardian called ‘Special Report: Tanzania’, greeted me on Thursday 21st May 1992. A handful of articles and several advertisements extolling the virtues of doing business in Tanzania, were a real surprise to me since I had never seen anything similar before; Nigeria, Kenya or Uganda perhaps, but never Tanzania. I soon realized that this was part of Tanzania’s investment campaign taking place in London with a Confederation of British Industry (CBI)/East African Association Seminar arranged for the following day. ‘The Changing Face of Tanzania: Business Prospects’ stimulated a huge interest. From Tanzania, the Prime Minister John Malecela, brought four ministers, the Governor of the Bank of Tanzania, George Kahama, Director of the Investment Promotion Centre (IPC) , plus numerous other officials. All the senior diplomats were assembled from the Tanzanian embassies in Europe. More than double the usual number of participants at CBI seminars were enrolled. The Conference Administrator reported that the phone had never stopped ringing with enquiries. When asked to explain the popularity of th s conference, she suggested it was due to the friendliness of the Tanzanians. So, the following morning I joined the 230 men and 5 women to attend the conference at Centre Point. I had discovered a special entry rate of £30 plus VAT was available for members of the Britain-Tanzania Society (BTS) as the regular fee of £282 is certainly beyond my means. Also present from the BTS were Roger Carter and Trevor Jagger. The format of the day was speeches and questions, very ably and smoothly chaired by Tom Brazier, Chairman of the East African Association. Sir David Gilmore started proceedings with a very informative and welcoming speech. This was followed by presentations by the Tanzanian team. Quite clearly, everything is changing. Tanzania is very keen to welcome business to its shores . Time and again we were reminded of the glorious scenic beauties of Tanzania from Kilimanjaro to the Indian Ocean, from historic Zanzibar to the Serenget1. We were also told of the vast potential for agriculture, fisheries, minerals and natural resources. The businessmen were told several times about the fiscal changes, no tax for five years, freedom to remit profits and dividends, and the assistance available to establish new work in Tanzania. -Will Tanzanians benefit from this change of economic policy? -Do Tanzanians want all their octopus taken? -Do Tanzanians want any of their other natural resources exploited? -Does Tanzania have safeguards in place to protect it from over development ? (which means money and people to monitor activity). -Who benefits and who loses out? – The UK is still Tanzania’s leading trading partner with a 22% share of the market . Our closest competitors are Italy (16%), Japan (13.3%) and Germany (11.7%). In 1991 we exported goods to the value of some £73 million and imported £21 million – mostly tea and coffee. Britain’s Area Advisory Group for the Department of Trade and Industry has designated Tanzania as one of its ‘markets to watch’ and it is possible that it will consider an investigative mission in 1993. Tanzania’s remarkable stability gives it advantages over many of the neighbouring states. It is to be congratulated on its marketing and cooperative reforms, political pluralism, independent press, the record in human rights . . .. But it is a competitive world. There have been changes in banking but no foreign banks are yet operating in Tanzania; none of the parstatals have been sold or liquidated yet; there is need for progress on a double taxation agreement and there is the problem of outstanding commercial debts dating back to 1979 – Sir David Gilmore, Permanent Under-Secretary of State at the Foreign and Commonwealth Office. – Many people neighbouring Tanzania have found the country to be a safe haven whenever they felt severely threatened in their own countries .. . even the wild game have the same feelings . It is no wonder that Tanzania has 25% of her territory reserved for game parks … ,. It is our intention to make the Investment Promotion Centre a ‘One-Stop-Centre’ to speed up the process of approving investment projects .. . . Between 1990 and April 1992 some 35 projects which are wholly owned by British firms or in partnership with Tanzanian counterparts have been set up …. I really hope that you will be able to look into new possibilities – John Malecela. – The factors which were most influential in our deciding to increase our investment in Tanzania were the stability and remittability of funds but …. we have encountered some resistance from minor offici also to the implementation of IPC investment approvals and there is continuing uncertainty on who in Government is responsible for privatisation and who we should negotiate with – Tom Brazier, Chairman, Brooke Bond Ltd.
Aid donors and international organisations meeting in Paris on June 29 th and 30th 1992 pledged about US$ 990 million to help finance Tanzania’s development programmes next year. Almost two thirds of the funds will be provided in the form of grants – World Bank News. The Tanzanian Government bowed on July 16th to pressure from Members of Parliament and delayed implementing a decision it had earlier announced to privatise the sale of cash crops. “The Government has, with immediate effect, suspended the new crop purchasing procedure until next year” Prime Minister John Malecela told the National Assembly. The decision was a setback to economic reforms being pressed by the International Monetary Fund (IMF). The Government had originally decided also to abolish further interest-free loans for cooperatives to help them to buy crops after the State-run National Bank of Commerce had accumulated US$’5 million in bad debts from cooperatives; the reversal of policy meant that this decision was also reversed. Mr Malecela explained that the Government’s earlier decision to end a monopoly enjoyed by the cooperative movement had been designed to encourage competition. But angry legislators said that farmers would turn to smuggling if private businesses were allowed to buy crops. “We cannot let cooperatives compete with the wolves” said the Member of Parliament for a northern wheat growing constituency. Tanzania Electricity Supply Company’s (TESCO) 30-year monopoly on the production and supply of electricity has been ended. Minister for Water, Energy and Minerals Jakaya Kikwete told Parliament that it would take years for the whole country to be energised unless private organisations and individuals were free to enter the power market. The new Minister for Information and Broadcasting, Dr Shija has told the National Assembly that plans have been finalised for a three-phase programme (estimated to cost Shs 13 billion) for the introduction of television. Some 18 TV stations would need to be built and the Government had agreed to cooperate with local and foreign investors who had shown interest.